"In rare move, Texas parole board recommends clemency for death row inmate Thomas Whitaker" was first published by The Texas Tribune, a nonprofit, nonpartisan media organization that informs Texans — and engages with them — about public policy, politics, government and statewide issues. In an exceedingly rare move, the Texas Board of Pardons and Paroles voted Tuesday to recommend a lesser sentence for a death row inmate facing execution. The board voted unanimously in favor of clemency for Thomas Bartlett Whitaker, a man who is set to die on Thursday evening. The decision now falls on Gov. Greg Abbott, a Republican who can approve or deny the recommendation to change Whitaker’s death sentence to life in prison. The last time the board recommended clemency for a death row inmate was 2009. A Texas governor hasn't approved clemency since 2007. Abbott said at a political rally Tuesday night that he and his staff would base his decision on the facts, circumstances and law. Whitaker, 38, was convicted in the 2003 murders of his mother and 19-year-old brother as part of a plot to get inheritance money. His father, Kent Whitaker, was also shot in the attack but survived and has consistently begged for a life sentence for his son. “Victims’ rights should mean something in this state, even when the victim is asking for mercy and not vengeance,” Kent Whitaker said at a press conference at the Texas Capitol just before the board’s vote came in. Keith Hampton, Thomas Whitaker's lawyer, choked up when announcing to the family and the press that the board had recommended clemency. Kent Whitaker's wife cried out and grabbed Whitaker, who let out a sob and held his head in his hands. “Well, we’re going to the governor’s office right now,” Hampton said. In December 2003, Thomas Whitaker, then 23, came home from dinner with his family knowing that his roommate Chris Brashear was waiting there to kill them, according to court documents. When they entered the house, Brashear shot and wounded Thomas’ father and killed his mother, Patricia, and 19-year-old brother, Kevin. Suspicion turned toward Whitaker in the murder investigation the next June, and he fled to Mexico, according to court documents. He was arrested more than a year later, and his father begged the Fort Bend County District Attorney’s Office not to seek the death penalty. Whitaker offered to plead guilty to two life sentences, but the prosecution rejected the offer, saying Whitaker wasn’t remorseful and was being manipulative, court records show. They sought the death penalty, and in March 2007, they got it. Brashear was given a life sentence. Fred Felcman, the original prosecutor in the case, said Tuesday that the parole board made its decision only because of the father’s forgiveness and seemingly didn't take into account the large number of other people affected by the murders, including the victims, the county, the jury and Patricia’s family. He said the board also disregarded testimony from psychiatrists and their own investigators who said Whitaker was manipulative. “I’m trying to figure out why [the board members] think they should commute this, and why the governor should even give it a second thought,” said Felcman, who is first assistant district attorney at Fort Bend County. In Whitaker’s clemency petition, Hampton asked the board to listen to the inmate’s father, since he is the one who was hurt most by the crime, having watched his wife and son die before his eyes as he suffered from his own gunshot wound to the chest. “He is the last member of my direct family, and he’s gonna be taken from us by the state of Texas in the name of justice in a way that none of my family wants,” Whitaker said just before the board decision. Attached to Whitaker’s petition to the board were letters from former prison guards and at least seven death row inmates who thought the condemned man deserved the lesser sentence of life in prison. Kent Whitaker said Tuesday that the guards said he was never a threat, and one said he’d be an asset in general population. Death row inmates attested to Whitaker’s helpful presence in a prison environment, saying he encouraged them to better themselves, helped those with mental illness and could easily calm inmates down. William Speer, who has been on death row since 2001 for a prison murder, wrote in 2011 that the prison system needs more men like Whitaker to keep other inmates calm. Abbott isn’t Whitaker’s only shot at canceling his execution Thursday. He also has final appeals pending at the U.S. Supreme Court, which largely focus on the drugs used in Texas executions. The lawsuit was filed in 2013 on behalf of Whitaker and another death row inmate, Perry Williams, and challenges Texas’ execution protocol. The case has gone back and forth in courts for several years, and has largely been rejected by judges. Defense lawyers claim in part that the state’s failure to conduct additional testing of a drug before an execution and its use of old drugs violates the U.S. Constitution. In the last year, the Texas Department of Criminal Justice has seemingly pushed back the expiration dates on the compounded drug used in executions twice. The U.S. Supreme Court is set to consider the case in conference Friday — the day after Whitaker’s scheduled execution. Whitaker’s lawyers have asked the court to delay his execution while the case is ongoing, but the Texas Attorney General’s Office has sought in federal court to push on with the execution. The state’s petition said lower courts have sided with Texas so far and there isn’t a reasonable probability Whitaker will get relief from the high court. Whitaker could also ask the U.S. Supreme Court to overturn a recent decision by the Texas Court of Criminal Appeals that rejected a challenge of the instructions juries are given when considering death sentences. To sentence someone to death in Texas, a jury must unanimously agree that the individual would likely be a future danger to society if given the alternative punishment of life in prison. Last Thursday, the Texas appellate court rejected a claim from Whitaker’s lawyers stating that he should avoid execution because the jury was wrong in determining that Whitaker would be a danger, since he has been a model prisoner on death row. Despite the board’s surprise recommendation on Tuesday afternoon, Whitaker was still scheduled for execution on Thursday after 6 p.m. If Abbott rejects the recommendation and the Supreme Court justices dismiss his appeals, he will become the fourth man executed in Texas in 2018. There are three other executions scheduled in Texas through May. Correction: A previous version of this story gave an incorrect year for the last time the Texas Board of Pardons and Paroles recommended clemency for a death row inmate. It was 2009. 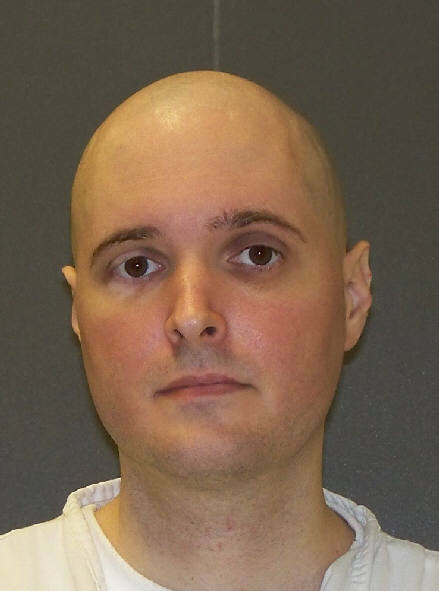 In rare move, Texas parole board recommends clemency for death row inmate Thomas Whitaker By Jolie McCullough February 20, 2018 * This story has been updated throughout. In an exceedingly rare move, the Texas Board of Pardons and Paroles voted Tuesday to recommend a lesser sentence for a death row inmate facing execution. The board voted unanimously in favor of clemency for Thomas Bartlett Whitaker, a man who is set to die on Thursday evening. The decision now falls on Gov. Greg Abbott, a Republican who can approve or deny the recommendation to change Whitaker’s death sentence to life in prison. The last time the board recommended clemency for a death row inmate was 2009. A Texas governor hasn't approved clemency since 2007.&nbsp; Abbott said at a political rally Tuesday night that he and his staff would base his decision on the facts, circumstances and law. “Any time anybody's life is at stake, that's a very serious matter,” Abbott said. “And it deserves very serious consideration on my part.” Whitaker, 38, was convicted in the 2003 murders of his mother and 19-year-old brother as part of a plot to get inheritance money. His father, Kent Whitaker, was also shot in the attack but survived and has consistently begged for a life sentence for his son. “Victims’ rights should mean something in this state, even when the victim is asking for mercy and not vengeance,” Kent Whitaker said at a press conference at the Texas Capitol just before the board’s vote came in. Thomas Bartlett Whitaker TDCJ Keith Hampton, Thomas Whitaker's lawyer, choked up when announcing to the family and the press that the board had recommended clemency. Kent Whitaker's wife cried out and grabbed Whitaker, who let out a sob and held his head in his hands. “Well, we’re going to the governor’s office right now,” Hampton said. In December 2003, Thomas Whitaker, then 23, came home from dinner with his family knowing that his roommate Chris Brashear was waiting there to kill them, according to court documents. When they entered the house, Brashear shot and wounded Thomas’ father and killed his mother, Patricia, and 19-year-old brother, Kevin. Suspicion turned toward Whitaker in the murder investigation the next June, and he fled to Mexico, according to court documents. He was arrested more than a year later, and his father begged the Fort Bend County District Attorney’s Office not to seek the death penalty. Whitaker offered to plead guilty to two life sentences, but the prosecution rejected the offer, saying Whitaker wasn’t remorseful and was being manipulative, court records show. They sought the death penalty, and in March 2007, they got it. Brashear was given a life sentence. Fred Felcman, the original prosecutor in the case, said Tuesday that the parole board made its decision only because of the father’s forgiveness and seemingly didn't take into account the large number of other people affected by the murders, including the victims, the county, the jury and Patricia’s family. He said the board also disregarded testimony from psychiatrists and their own investigators who said Whitaker was manipulative. “I’m trying to figure out why [the board members] think they should commute this, and why the governor should even give it a second thought,” said Felcman, who is first assistant district attorney at Fort Bend County. In Whitaker’s clemency petition, Hampton asked the board to listen to the inmate’s father, since he is the one who was hurt most by the crime, having watched his wife and son die before his eyes as he suffered from his own gunshot wound to the chest. “He is the last member of my direct family, and he’s gonna be taken from us by the state of Texas in the name of justice in a way that none of my family wants,” Whitaker said just before the board decision. Attached to Whitaker’s petition to the board were letters from former prison guards and at least seven death row inmates who thought the condemned man deserved the lesser sentence of life in prison. Kent Whitaker said Tuesday that the guards said he was never a threat, and one said he’d be an asset in general population. Death row inmates attested to Whitaker’s helpful presence in a prison environment, saying he encouraged them to better themselves, helped those with mental illness and could easily calm inmates down. William Speer, who has been on death row since 2001 for a prison murder, wrote in 2011 that the prison system needs more men like Whitaker to keep other inmates calm. “Of all the people I have met over the years Thomas Whitaker is the person I believe deserves clemency the most,” Speer wrote, according to the petition. “He is one of the best liked inmates on this farm by the guards and other inmates, and he has worked the hardest to rehabilitate himself.” Abbott isn’t Whitaker’s only shot at canceling his execution Thursday. He also has final appeals pending at the U.S. Supreme Court, which largely focus on the drugs used in Texas executions. The lawsuit was filed in 2013 on behalf of Whitaker and another death row inmate, Perry Williams, and challenges Texas’ execution protocol. The case has gone back and forth in courts for several years, and has largely been rejected by judges. Defense lawyers claim in part that the state’s failure to conduct additional testing of a drug before an execution and its use of old drugs violates the U.S. Constitution. In the last year, the Texas Department of Criminal Justice has seemingly pushed back the expiration dates on the compounded drug used in executions twice. The U.S. Supreme Court is set to consider the case in conference Friday — the day after Whitaker’s scheduled execution. Whitaker’s lawyers have asked the court to delay his execution while the case is ongoing, but the Texas Attorney General’s Office has sought in federal court to push on with the execution. The state’s petition said lower courts have sided with Texas so far and there isn’t a reasonable probability Whitaker will get relief from the high court. Whitaker could also ask the U.S. Supreme Court to overturn a recent decision by the Texas Court of Criminal Appeals that rejected a challenge of the instructions juries are given when considering death sentences. To sentence someone to death in Texas, a jury must unanimously agree that the individual would likely be a future danger to society if given the alternative punishment of life in prison. Last Thursday, the Texas appellate court rejected a claim from Whitaker’s lawyers stating that he should avoid execution because the jury was wrong in determining that Whitaker would be a danger, since he has been a model prisoner on death row. Despite the board’s surprise recommendation on Tuesday afternoon, Whitaker was still scheduled for execution on Thursday after 6 p.m. If Abbott rejects the recommendation and the Supreme Court justices dismiss his appeals, he will become the fourth man executed in Texas in 2018. There are three other executions scheduled in Texas through May. Correction: A previous version of this story gave an incorrect year for the last time the Texas Board of Pardons and Paroles recommended clemency for a death row inmate. It was 2009. "In rare move, Texas parole board recommends clemency for death row inmate Thomas Whitaker" was first published at by The Texas Tribune, a nonprofit, nonpartisan media organization that informs Texans — and engages with them — about public policy, politics, government and statewide issues. Link back to the original article, which is located at https://www.texastribune.org/2018/02/20/rare-move-texas-parole-board-recommends-clemency-death-row-inmate-thom/.